I’ve been a fan of Ben Kane’s books since the Forgotton Legion, and when last year I read Hannibal: Enemy of Rome, it shot up into my top Historical Fiction reads and came out as clear top of Ben’s books. Given the fact that my love of Rome tends towards the Principate era and that I’ve never really concentrated on the early Republic, it surprised me how much it gripped me. And then Ben disappeared off for a while to write his Spartacus series. Don’t get me wrong: the Spartacus books were excellent books and I thoroughly enjoyed them, but when Hannibal was my fave, it made me twitch having to wait so long for a second in the series. 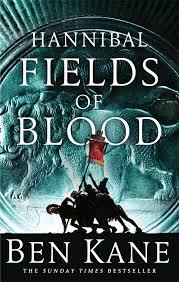 And finally, as time allowed, I managed to get stuck into Fields of Blood. Taking up where the first book finished, with Carthaginian forces firmly ensconced in Italy and threatening Rome, we knew this book was going to involve some of the most brutal fighting in the republic’s history. Most likely, it was going to involve Cannae – a name that despite my lack of in depth knowledge of this early era, I was well aware of. No one can give any level of study to the roman military without hearing the names of a few choice battles: Alesia, Adrianople, Actium, the Teutoborg forest… and of course Cannae. But I’m getting ahead of myself. This book is still about people primarily, rather than powers or armies. It still centres on the Roman group of Aurelia, Quintus and Gaius and the Carthaginian family of Hanno, Sapho and Bostar. And what this second book in the series does (and does very well) is to grow the characters beyond the bounds of the first book, and to deepen and expand the relationships between them, largely by testing those relationships to breaking point. Quintus and Gaius and Fabricius are away at war, leaving the women at home, where Aurelia struggles against her apparent destiny in an arranged marriage while the man she really loves fights for the Carthaginian general intent on destroying Rome. While she does what she can to fight this fate, her mother struggles with family troubles and loan sharks intent on ruining her. Quintus finds himself threatened with dismissal and being sent home, and decides on a drastic course of action that will see him beginning his military career over, from the bottom, where he will encounter dangers from within his own ranks as well as from the enemy. Hanno is still recovering from having let Hannibal down and has narrowly escape brutal punishment. Now he is doing all he can with his phalanx of men to regain the favour of his general while at the same time trying to decide whether his brother Sapho is really mad enough to want him out of the way. The scene is set. Hanno and his army are worryingly close to the farm where he had first got to know Aurelia, and she is almost all he can think of – her and a Roman officer who has become the focus of his vengeance. Parallels can be found between the two young men’s journey throughout the book, the main of which is watching their progress and growth as military men while having to keep out a wary eye for the dangers that hover about them waiting to put a knife in their spine. As usual with Ben’s books, the level of historical detail included within is stunning, with close attention paid right down to sentence level, and the authentic feel that lends the book is intense. And on to the battle. I won’t ruin it for anyone. There will be people who do not know how great and important Cannae was to Rome. There will be people who do not know which side won. And therefore I’m not going to tell you. Read the book and find out. But suffice it to say Cannae was immense. In fact, Ben described it just today as ‘the bloodiest battle on Italian soil for 2000 years’, so that gives you some idea. And the level of attention Ben has lavished even on the battle means that it occupies a sizable chunk of the book. Given that the entire battle is seen through the eyes of Quintus and Hanno, it is quite impressive how the epic scale is made plain to the reader while maintaining a personal point of view of the close action encountered by the characters. It is hard not to be swept up in the action, rejoicing and cheering for both sides when things are going their way and panicking and fretting for them all when they’re not. And if you’re not familiar with the battle already, you will be kept guessing about the outcome for a while. But despite all of this, and the power of the battle itself, the thing that the book actually left me with more than anything is something I encountered with Giles Kristian’s Bleeding Land. It was the aftermath of the battle. Just as with that other book, where we experienced the dead freezing on the field below Edgehill while ghouls snapped off their fingers for the ring they bore, in Fields of Blood we get to experience all the horror of the battlefield in high summer, full of the most unimaginable sights, to witness the relief of the victors as soldiers seek out their family among the survivors or the dead, to see the surviving losers running scared, hiding in groups and experiencing utter despair. To see what happens to the people as they hear the news. The story of Hannibal is far from over and Ben Kane has many more books in the series before he writes of Zama and the fall of Carthage, but this is a significant step in the tale both on the scale of the nations themselves, and of the characters that go through it all. With some series, I find myself beginning to get irritated with characters in the second book because they are not changing or growing, or just become stagnant. Such is not the case in Fields of Blood. I just want to see more of them and am now going to have to impatiently anticipate ‘Clouds of War’. Bravo once again, Ben. For you to produce a book that actually manages to get me behind Rome’s enemies is quite a feat! Kane’s top series and it looks to be going from strength to strength, people. Buy and enjoy.